Red Panda Particle Review – Best Granular Delay / Pitch Shifter Pedal? The Red Panda Particle Granular Delay / Pitch Shifter is one of the most creatively original delay pedals I’ve ever seen and played. If your love for unorthodox effects extends to the realm of computer software, you may have come across some granular delay plugins in recording DAWs like Ableton Live. Well, Red Panda have done the unthinkable and have brought granular delay and pitch shifting to guitarists in compact pedal form. It’s perhaps inappropriate to ask if this is the best granular delay / pitch shifter pedal as it’s the only pedal I know of that offers authentic granular delay effects at the time of this writing. 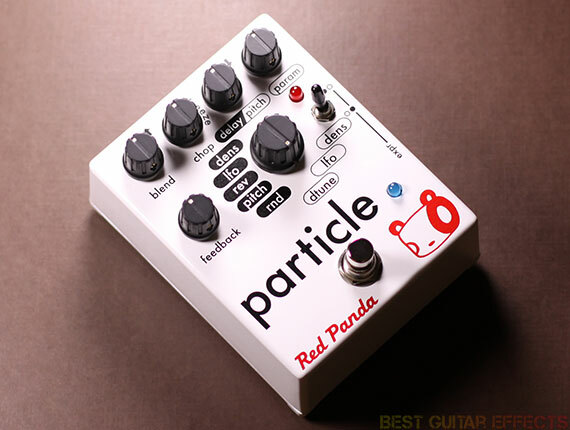 But my aim with this review of Red Panda’s Particle is to find out just how good it is and if this ambitious pedal deserves a place on your pedalboard. Now let’s run down the features and chop things up. Chop – Controls the grain size from 7:00-12:00. Above 12:00, sets freeze threshold. Delay/Pitch – Controls the delay time or pitch shift range (depending on mode). Pitch shift range is +/- 1 octave, with no pitch shift at 12:00. Delay time range is from 0 to up to 900 ms (depending on mode). Feedback – Audio feedback (repeats). Mode – Selects between the following modes: Delay Dens, Delay LFO, Delay Rev, Delay Pitch, Delay Rnd, Pitch Dtune, Pitch LFO, and Pitch Dens. LEDs – The upper LED blinks red when clipping occurs. The lower LED is blue when the effect is engaged. Expression Pedal Control – Plug an expression pedal into the EXPR jack to control the pitch/delay or param knobs. Any expression pedal with a 10k-50k ohm linear pot will work. For example, the Roland EV-5, Moog EP-2, M-Audio EX-P, or Mission Engineering EP-1. When an expression pedal is used, the knob sets the maximum value. If your expression pedal has a minimum value knob, you can control the knob over a specific range of values. All Red Panda pedals require a 9V DC center negative, regulated power supply (Boss style). 24-bit A/D and D/A converters. Combination of surface mount and through-hole components. Visit Red Panda for more info about the Particle. This pedal is intense. If you like insane pedals, you’ll probably love it. From the moment I plugged it in I was blown away by the awe-inspiring sounds that can be coaxed out of this unique little stompbox. The Particle is an incredibly deep delay and pitch mangling pedal for guitarists who live for creating bizarre soundscapes and glitched out noise effects. I stumbled across a few slightly traditional sounds inside, but make no mistake, this pedal is made for musicians who wish to tread new ground and push their music into new sonic territories. I’m going to cover each mode and give some example settings for some of the cool sounds that can be achieved with the Particle. Let me warn you beforehand, talking about this pedal doesn’t do it justice. But when you get your hands on one, try some of the settings I mention below to dig right in to some great starting points for your own exploration of Red Panda’s Particle. Or you can skip all this and watch my Particle review YouTube demo. You too will likely become a believer! The delay dens mode highlights some of the traditional and extreme sounds that can be created. Setting Blend and Feedback to noon, Chop and Delay/Pitch to 9 o’clock, and Param to max produces a variation of a spring style reverb that has an even more metallic tonality than your traditional spring reverb. Really cool effect. From here, turning the Chop and Delay/Pitch towards 10 o’clock brings in a somewhat digital delay type sound with ambient trails. Imagine an artificial robotic emulation of an old analog tape delay. Try bringing down the feedback to around 9 o’clock for a cool granular slapback delay effect. Also, experiment with the Delay/Pitch knob to dial in your the delay time. 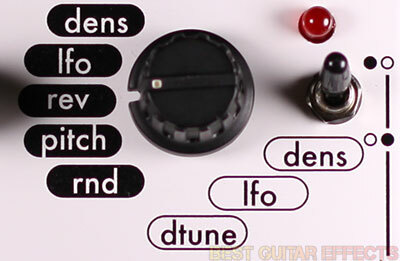 The Delay Dens mode alone offers a playground of delay tones unlike anything I’ve heard from any other delay pedal. This mode adds some LFO modulation to your delays that work well for pseudo-traditional modulation effects thanks to the Particle’s low delay times. With the Blend, Chop, and Feedback to noon, and the Delay/Pitch and Param knobs turned all the way down, you can push the Delay/Pitch up slightly until you hear a phaser-like chorusing effect happening. The sweet spot is somewhere between 7 to 8 o’clock. This produces some very clean and lush modulation that adds to the versatility of this pedal. Crank the feedback all the way up, and the phasing effect will sound even more intense as the signal self-oscillates. Push the Delay/Pitch up just a little bit more towards 8 or 9 o’clock for slightly more twisted, glitchy sounds. From here you can start getting crazy with the Delay/Pitch for robotic degenerative insanity. The Particle can do some really great reverse delay sounds. Turn all the knobs to noon for an easy starting point. With the Param at noon the delays will randomly play forwards or in reverse. Turn the knob all the way down for a reverse delay or all the way clockwise for a forward delay. Bringing down the Chop knob expands the range of available delay time while adding a glitchy sound to the delays. Also, try the original all noon setting but with the Feedback maxed for maximum reverse delay ambience. This is one of my favorite modes for creating textural soundscapes. The delay pitch mode adds random pitch shifting to your delay signal. It’s one of the crazier modes that you essentially have little precise control over. The question here is just how random do you want the results to be. I say go all out! Set Blend and Chop to noon, Feedback fully counterclockwise, Param maxed out, and Delay/Pitch to taste. The sounds produced will have sputters of random pitch shifting glitchery. Crank the Feedback for more intensity. Wild and weird, this is a cool mode for those who like to make things sound a bit messy. The delay rnd mode is another option for extreme sound mangling, adding random fluctuations of delay time for crazy stuttering effects. Here’s a setting I like that makes use of the expression pedal input as well. Turn the Blend, Delay/Pitch, and Param knobs fully clockwise, set Chop to noon, and the Feedback at minimum. Set the expression pedal toggle switch to control the Delay/Pitch knob. You can now go from a completely dry tone with no latency to a glitchy, beat-repeat style effect. This gives you the option of a pristine clean sound that you can destroy at will. The pitch detune mode is an awesome bonus for those looking for more than a standard delay pedal and another one of the standout features of this pedal. The Delay/Pitch knob will let you dial in an accompanying harmony ranging from -1 octave to +1 octave. Setting Blend and Chop to noon, Param and Feedback fully counterclockwise and cranking the Delay/Pitch knob brings in a secondary tone one octave up from your original guitar signal. (Bringing down the Delay/Pitch knob to around 2 o’clock lets you tune to a 5th.) You can use the Param control to bring in a warbling LFO effect that will warp your harmony tone. The Feedback control is also useful for feeding the pitch-shifted tone into itself and creating additional harmonic overtones. The various Pitch modes give the Particle life on your pedalboard outside of the realms of delay, ensuring that this creative pedal will become a muse for many different occasions. The pitch lfo mode has one particularly fun setting I really like to use in conjunction with an expression pedal. Set Blend to noon, Chop and Feedback fully counterclockwise, and bring the Param and Delay/Pitch knobs all the way up. Use the expression pedal to control the rate of the LFO by setting it to modulate the Param knob. You can go from a slow rising pitch-shift to a throbbing cacophony of sound. It’s worth experimenting with the Feedback control here, too, or setting the Delay/Pitch near unison for a glitchy vibrato-like effect. This just might be my favorite mode of the Particle, and it practically begs to be used with an expression pedal. Both of my favorite settings here are very easy to dial in. Set the Blend, Delay/Pitch and Param to fully clockwise and cut the Feedback and Chop all the way down. Set the expression pedal switch to modulate the Param knob for some cool gated, stuttering effects. The Param essentially controls the timing of the glitching, making it quite fun to control in realtime for cool slowdown effects. Flip the switch to modulate the Delay/Pitch instead and the sound is entirely different, letting you cascade between a -1 and +1 octave range in a surrealistic sweep of sound. For fine-tuning of these effects, tweak the Chop and Feedback for even more trippy sounds. And thats my verbal rundown of the modes and some cool tones to be discovered. Watch the Red Panda Particle review video for a better taste of what’s to be found within. 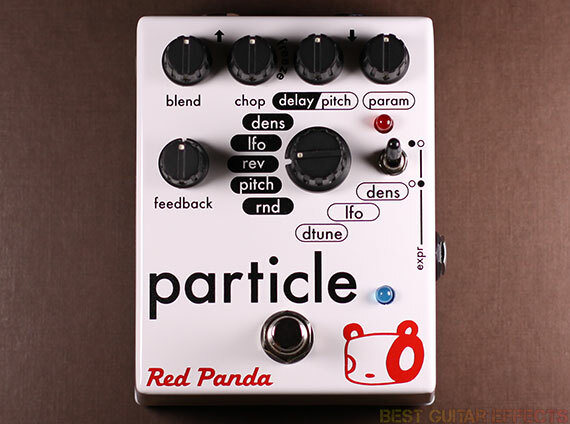 I absolutely love the Particle and applaud Red Panda for releasing such an ambitious pedal. I am inspired, however, to compose a brief wish-list of updates I’d like to see if there’s ever a Red Panda Particle 2.0. I like the sounds produced in various modes when turning the Chop knob to induce the Freeze effect, but perhaps Red Panda could have included a second (momentary) footswitch onto the enclosure (there’s enough room to fit 2 footswitches comfortably) to allow you to use the Freeze function spontaneously and easily in a live situation with a simple press of a footswitch. While the pitch-shifting is solid and stable, I personally appreciate a slightly less wobbly octave effect. Presets would be nice as there are so many great sounds in this pedal that quick recall of a few different sounds would make it even more performance friendly. And my single biggest personal want is for complete external MIDI control of all parameters. That would make for even more fun experimenting in the studio or on stage with automated effect programming with Ableton Live. You could create some unbelievable possibilities by programming and automating this groundbreaking pedal via MIDI! Stereo operation would also allow for more flexible placement in a stereo signal chain, like after a stereo looper. But this pedal is well worth having as is. And who knows what its greater success could bring if dedicated users asked for it. The Red Panda Particle is one of the most innovative delay pedals I’ve played and will likely attain classic status among those who sing its praises. 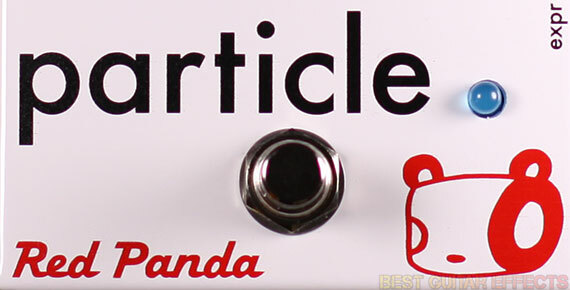 As Red Panda’s first standalone design, the Particle is a standout delay pedal that offers never before heard sounds. If you like it weird be sure to check out their other crazy guitar pedals including the Red Panda Context and Bitmap. Now let’s see the final result. The Red Panda Particle is one of the most unique and inspiring sonic weapons available for guitarists who love effects less ordinary. Few pedals offer this much sonic potential in a small enclosure, and none of them come close to replicating effects to the extent the Particle is capable of. With plenty of granulated variations on delay, chorusing, phasing, pitch-shifting, and echo/reverb-like sounds, this pedal is a treasure trove of twisted tones. It’s the best granular delay / pitch-shifter pedal by default and would likely only be topped by its successor if Red Panda were to create one someday. The Particle is a modern classic among unorthodox effects pedals. If you like it weird, watch my Red Panda Particle review Youtube demo. Then buy this pedal! That concludes our Red Panda Particle review. Thanks for reading. Want to buy the Red Panda Particle? I bought one of these in December and it’s been an adventure. I’ve had a hard time finding usable settings, my favorite so far has been the reverse with mix at 10 o clock, chop set just past the freeze threshold (2-3 o clock), delay/feedback at max and param at 9-10 o clock. There’s some cool Cave In-ish tones on the pitch density mode too. I’d really love to see an article that just runs through a list of awesome presets people have come up with. congratulations for your great reviews !!! 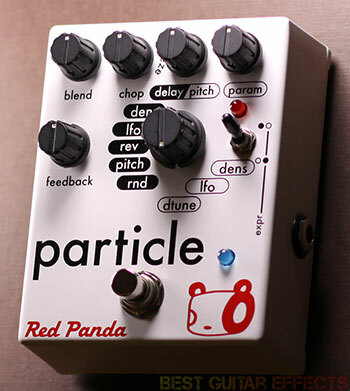 is the pitch ” quantized by semi tone ” on the red panda particule pedal ? thank you ! cheers !!! !